The Angriest: Highlander: The Series: "Mountain Men"
It is 9 November 1992, and time for another episode of Highlander: The Series. Tessa (Alexandra Vandernoot) goes travelling in a mountain region, only to be kidnapped by a trio of men who live rough off the land - and whose leader Caleb Cole (Marc Singer) plans to forcibly marry her. Once Tessa is missing, Duncan (Adrian Paul) arrives to search for her - bringing back memories of an immortal hermit that once lived in the region. Sometimes there are episodes for which there are no suitable words, and the best option for the reviewer is to just point in the episode's general direction and do 'jazz hand' motions. "Mountain Men" is, in spite of itself, pretty funny. I don't think it was supposed to be amusing, but sometimes bad television gets knocked sideways into the comedy genre by accident. Just after loosely remaking "Die Hard" in Vancouver, Highlander now goes the "Deliverance" route; albeit in a PG-rated version low on sexual assault and high on bad over-acting. The highlight (or low-light, depending on your point of view) is Marc Singer (V) who affects an incredibly bad Ozarks accent while chewing the scenery like nobody's business. Singer is generally a pretty decent actor, suggesting that he's engaging in the tried-and-true "Jeremy Irons in Dungeons & Dragons" acting method: realising you're in an awful bargain-basement production and choosing to go all out with the hyperbolic theatrics. Co-star Wes Studi (Dances with Wolves) plays his role of a local sheriff in an entirely deadpan and straightforward manner, and as a result he comes across as a bit of a waste. 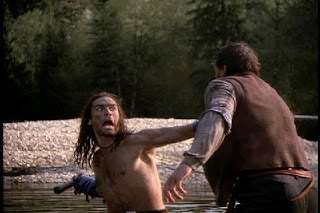 The episode's story stretches credulity: Tessa goes hiking in the precise area where an immortal (Caleb) lives, and he just happens to be looking for a woman to kidnap, having some time in the past already killed another immortal that Duncan befriended despite Caleb having never met or even heard of an immortal named Macleod before. It's nice to see the episode try and incorporate the Gathering into the action - something that "Bad Day in Building A" failed to do - but it feels remarkably haphazard and random. There is so good buried in among the bad. Duncan gets forced by Caleb's men to take a leap to his death off a cliff: the subsequent scene of his broken dead body cracking back together and returning him to life is something viewers haven't seen before. His subsequent shirtless rampage along the shallows of a river is right out of a period romance, and brings with it a certain iconic look. This is still, by any sane measure, a terrible episode. The hillbilly stereotypes along sink it. Seven episodes into Season 1, and two have been at least passable in quality. The ratio slips to 29 per cent.